After signing in 1991, Tony Dorigo, when fit, had been the automatic choice for the left back spot at Leeds United. However, that all changed at the end of the 1996-97 season. Manager George Graham made his first summer signing within 48 hours of the curtain coming down on a campaign which had offered very little entertainment but George had delivered his promise that the club would not be relegated. “I had played for over 12 years in the Scottish League with Aberdeen and Rangers and wanted a fresh challenge. 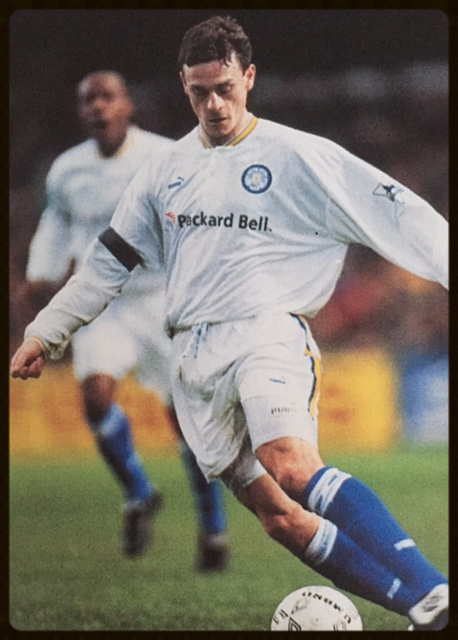 It was time for me to play at different stadiums, against different players and Leeds United offered me that opportunity. “George had tried to sign me a few seasons earlier when he was in charge at Arsenal and although I came to close to joining Torino in Italy and had offers from Spain, it was Leeds who I decided to join. I knew that stepping into Tony Dorigo’s shoes would be a hard act to follow and I must admit that I was surprised he was surplus to requirements. “All the lads who had signed that summer were staying at Oulton Hall and we all got on very well. There was Jimmy Floyd Hasselbaink, Bruno Ribeiro, Alfie Haaland and David Hopkin. Other than Jimmy, we all had young families and we helped each other settle in. “I had played an attacking full back role at Ibrox but all of a sudden George wanted me to play a more defensive role. This is something I struggled to adapt to and it took a while for the Leeds fans to see the best of me. “We beat Manchester United 1-0 thanks to a header from David Wetherall. I had witnessed and played in so many Old Firm derbies but the noise inside Elland Road that afternoon was incredible. We had a lot of fire in our bellies that day and we knew what it meant to Leeds fans everywhere when the final whistle was blown. After an inconsistent start to the season, we started to believe in ourselves and play with no fear. “There is no doubt that a special type of atmosphere is created at Elland Road and another fabulous occasion was at home to Derby County when we recovered from 3-0 down to win 4-3 courtesy of a last minute Lee Bowyer goal. “After about half an hour we went three down when a penalty, which I had conceded, was scored but thankfully we got in at half time having pulled two goals back. “The lads didn’t want the first half to end and the two quick goals we scored obviously changed the mood that George was in. Had we gone in 3-0 down, he would have ranted and raved and we would have probably lost 5-0 but there was so much positivity amongst the players that we knew we would complete the job and win the game. “The other game that will always stay with me was the 0-0 draw at Stamford Bridge. George had instructed us to go man for man on Chelsea and we really got stuck into them. “I was enjoying my football and really starting to show the fans what I was capable of. We had a real togetherness in the squad and a desire to keep winning. Despite the fact that George was a negative type of guy, he really turned Leeds around. It was a good place to be and we had many laughs. “I remember one morning on the training ground when George had a few of the lads practising a free kick routine. No matter how many times they tried, the ball didn’t end up in the net once. Shots were being fired in all sorts of directions and the gaffer had seen enough. “George had resigned and moved on to manage Tottenham Hotspur, David O’Leary had taken over and Ian Harte had made the left back spot his own. “Danny Granville was waiting in the wings and O’Leary wanted me out. I wasn’t fit enough to play in the reserves and as much as I tried to return to fitness, I knew deep down that my time at Leeds was up. “When my contract at Leeds was up at the end of the 2001 season, Dave Bassett invited me over to Barnsley and although I played a few games for their second team, it was evident that my knee would not stand up to the demands of competitive Second Division football. Eventually, the surgeons told me enough was enough and I had little choice but to call time on my playing career. Thank you to David Robertson for his time and giving me the opportunity to write this article.